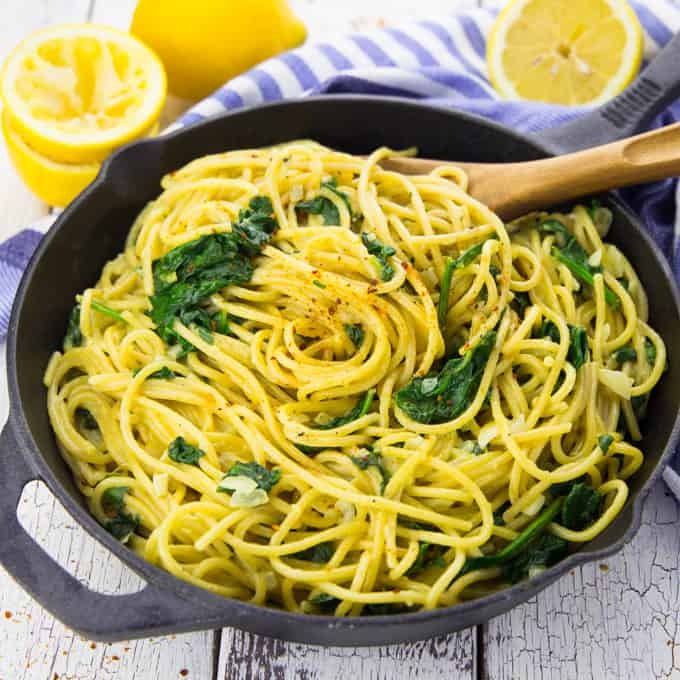 These lemon spaghetti with spinach are the perfect recipe for busy weeknights! 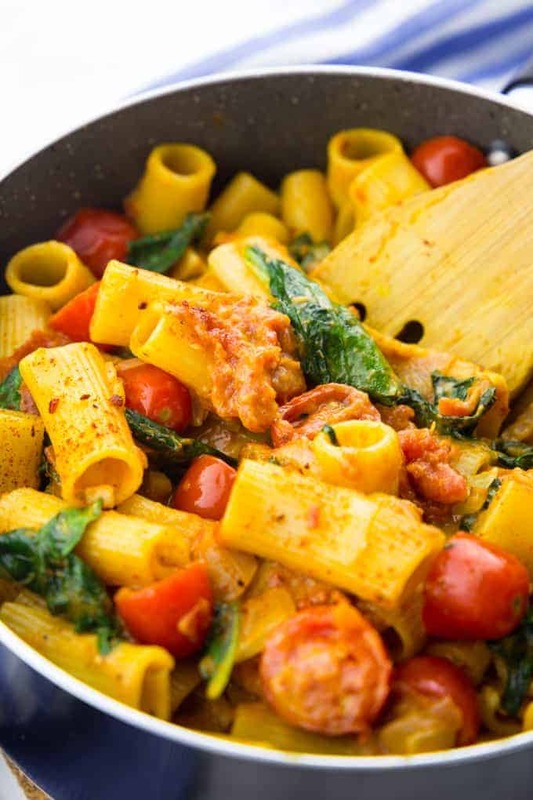 It’s a one pot meal, super delicious, comforting, and 100 % vegan! If you’ve been following my blog for a while, you know that I’m totally in love with vegan pasta recipes. And I’m also a huge fan of one pot meals! 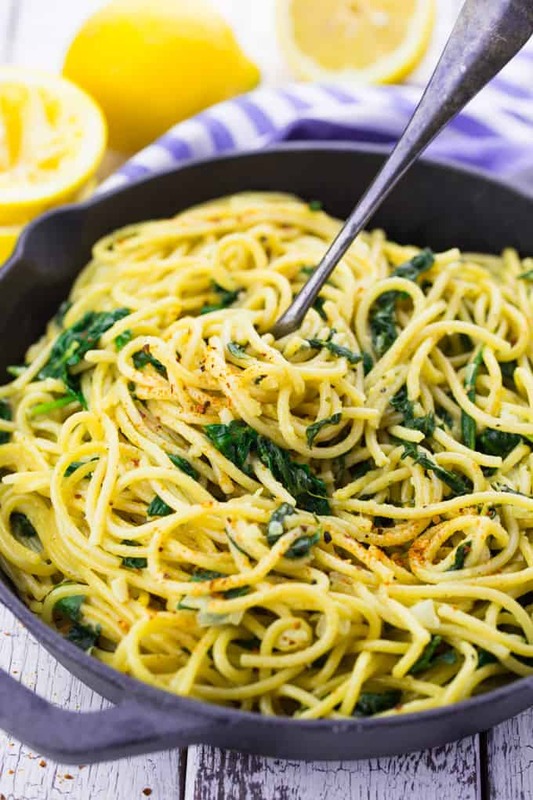 So these lemon spaghetti, or spaghetti al limone, are just perfect for me. We’ve had them a few times in the last couple of weeks and still can’t get enough of them. Sooo yummy! And the best thing is that you need only one pot to make them and you don’t even have to stay in the kitchen the whole time. Or actually you should probably stay close by, but you don’t have to do much. You only have to sauté the chopped onions and the garlic and then just add the remaining ingredients including the uncooked spaghetti. At first, I was a bit skeptical about one pot pasta, but I just love that the pasta is cooked in the pasta sauce. This gives the pasta dish a much deeper flavor! And you’ve got less dirty pots this way, which is also great. Sounds pretty easy, right? No fancy or hard to find ingredients! As always, you can find the full ingredient list and the recipe instructions in a separate, printable recipe box at the end of this post. The lemon spaghetti are actually more of a summer recipe, but I also love eating them in the winter. Maybe even more than in the summer! It kinda makes me feel like summer is already here. Haha! I love cold and sunny winter days with lots of snow, but I’m also looking forward to summer. Most of all, I’m looking forward to eating outside on our balcony again. That’s just the perfect end to a long day. Maybe even with a glass of white wine… Oh, I should stop talking about summer or I’m getting all nostalgic! 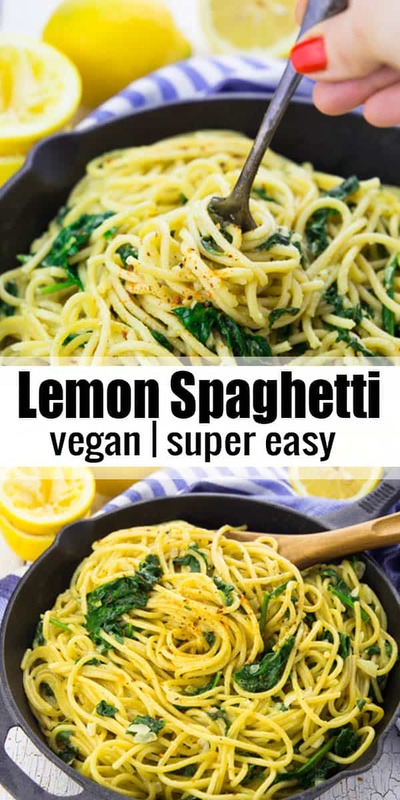 I hope you like the recipe for the vegan lemon spaghetti as much as we do around here! 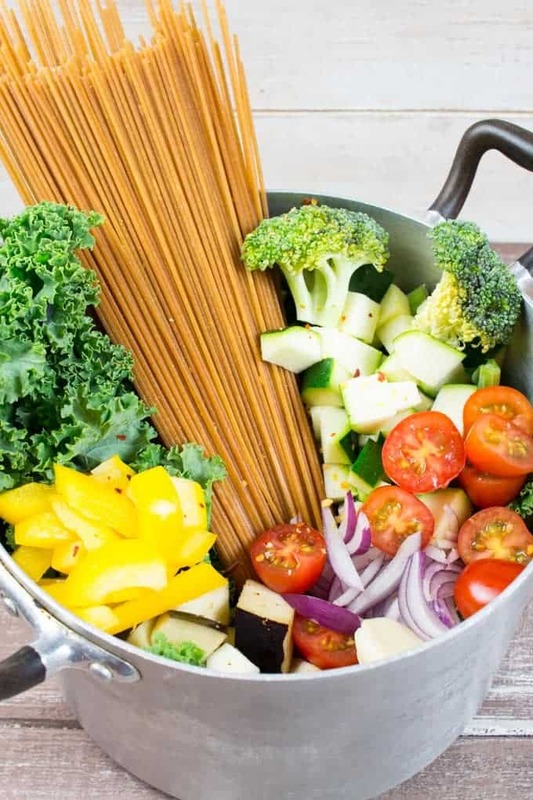 Looking For More Vegan One Pot Pasta Recipes? 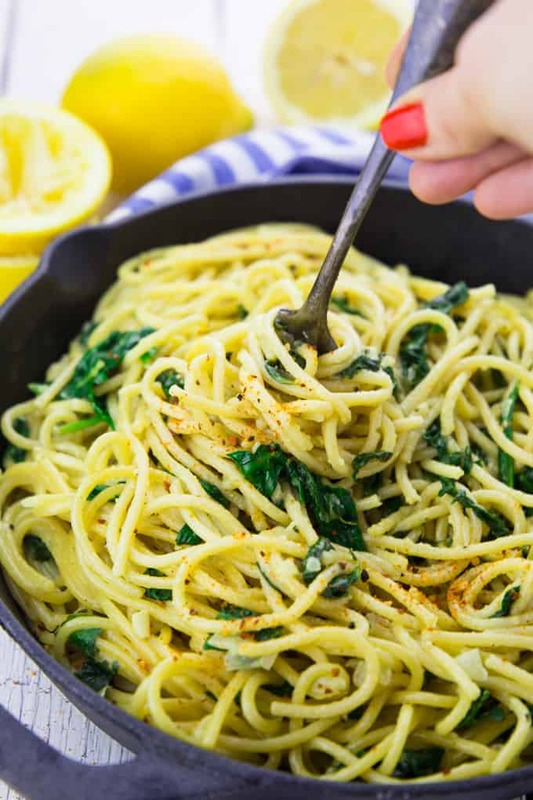 These lemon spaghetti with spinach are the perfect recipe for busy weeknights! 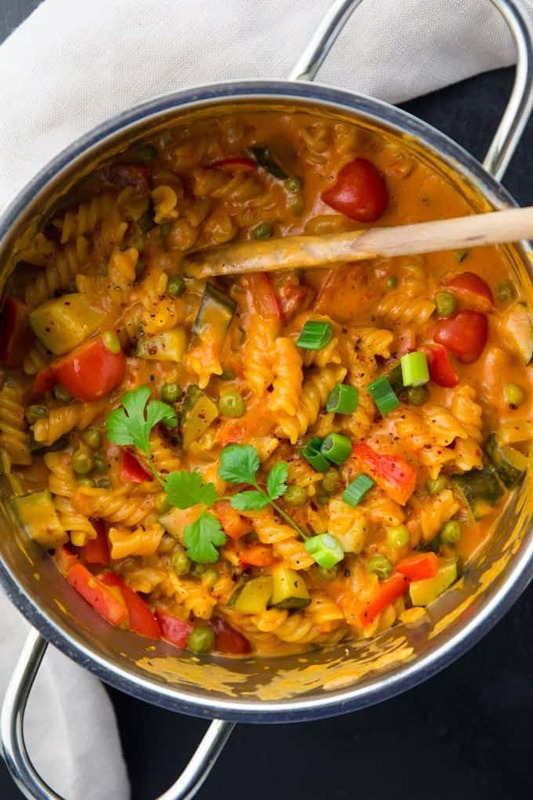 It's a one pot meal, super delicious, comforting, and 100 % vegan! In a large pot, heat some oil and sauté the onion for 3 minutes until it becomes translucent. Then add the garlic and cook for another minute. Add the uncoooked spaghetti, the vegetable broth, the coconut milk, and the lemon juice. Stir a couple of times and gently push the spaghetti in the liquid when they're soft enough (this might take a couple of minutes. Try not to break them when they're still too hard). Cook for 15-18 minutes. When the spaghetti are al dente, stir in the spinach and the lemon zest. Cook for 2 more minutes and season with salt, pepper, and red pepper flakes. Enjoy! 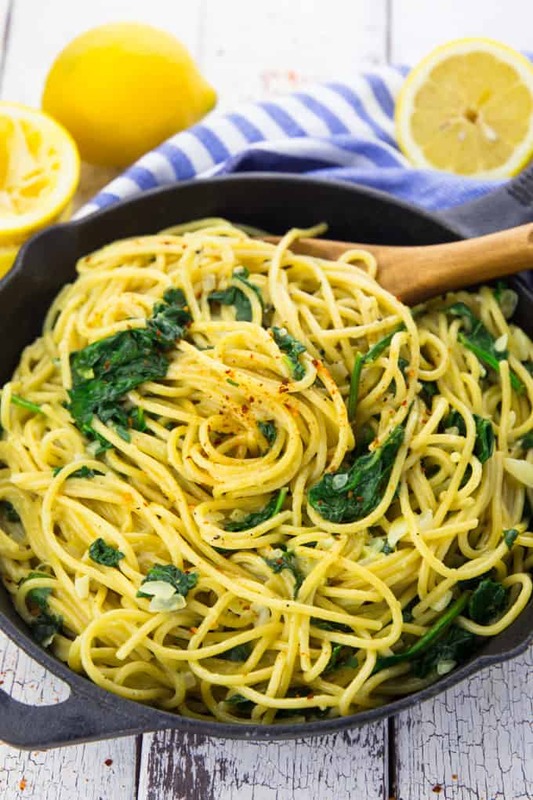 what type of coconut milk do you use in the lemon spaghetti with spinach? Canned? Full fat? So easy! I added kale instead of spinach and it was great! I made it this morning and it turned out so good. I think I used a pretty big lemon, so it came out a bit extra lemony but it will still great! I added some parmesan cheese at the end. Thanks for the recipe. I’ll have to try your other recipes too! We loved this! I added some sauteed zucchini, carrots, kale, & broccoli instead of the spinach and it was really good. Thanks for the great recipe! This was SO good. No, better than that, it was amazing. I know for a fact i’ll be adding this to my regularly made meals haha. Definitely suggest it to anyone thinking of making it. Really easy recipe yet sooo good :) I’m a student living on my own for the first time and this made my tummy and bank account happy ! Can I use the coconut milk from carton? I don’t want the full fat in the canned milk. You mean coconut milk in a carton like almond milk? Unfortunately this is not gonna work well as you won’t get a creamy sauce using this kind of coconut milk. It’s more like thin milk. However, could use light canned coconut milk instead. It won’t be as creamy as the original recipe, but you could definitely give it a try. Or sauté the onions in 2 T plant butter, add 2 T coconut flour and make s roux, add the veggie broth slowly and then the rest for the ingredients as shown. It’ll thicken up and do the job. I’m allergic to coconut. Do you think I could pull it off with some kind of substitute. You could try to substitute it with soy or oat cream if you want. I haven’t tried it yet but it got kind of the same consistency as full fat coconut milk. So I think this could work pretty well. This recipe is my absolute favorite vegan recipe I’ve prepared to date. I will prepare this for my non-vegan family and they’ll never know. Perfection! 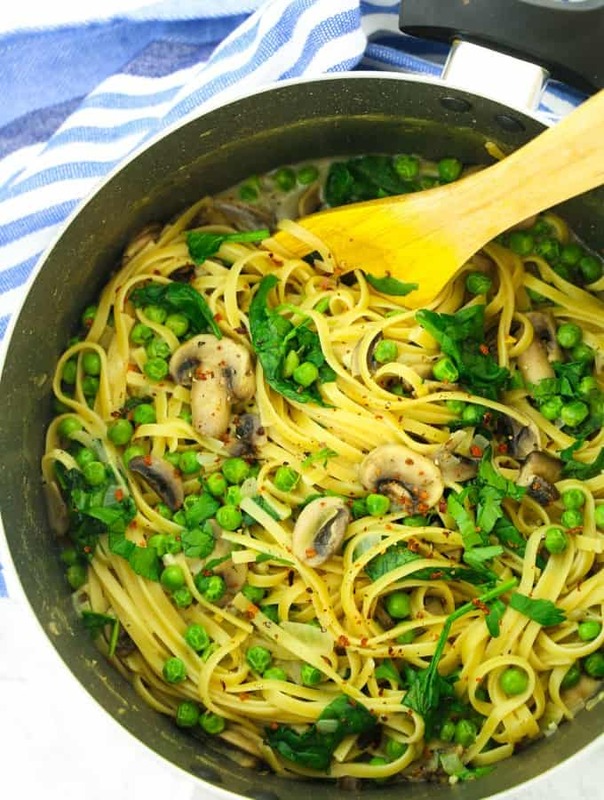 This is the first time I’ve ever rated a recipe, because my entire family of five (3 picky eaters aged 4, 4, and 7) LOVED this pasta! My kids are always very adamant about having their pasta completely plain, and they all had second servings of this pasta and went on about how they loved it. 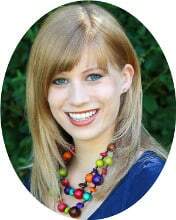 This recipe will be added to our regular rotation and I’m thrilled to have something new! Do you cook it on high for the 15-18 mins? Just made this and it’s a KEEPER!! Also added asparagus. We are planning this for Christmas Day! Has anyone tried spaghetti squash or rice pasta? I just made this with lentil pasta and it worked out perfectly. Just be mindful that rice pasta may vary in its cooking time to make sure to check. Spaghetti squash isn’t absorbent so I would not think that it would work well. We are just starting to make a change toward vegan eating! This recipe was amazing. My 3 kids and husband really liked it. I used my spiralizer and made zucchini noodles and added to the pasta. That was the only change but everyone said it was a keeper! Thanks for the recipe. Wow…I made this the moment I saw the recipe on Pinterest, because it was everything I had in the house. Subbed angel hair for spaghetti, and this was amazing. Sooo gooood!!! The flavors go so well! Nothing is overpowering. The flavors of the lemon, garlic, chili flakes & the starchy pasta marry so well! I used angel hair & i felt like every bite was just loaded with flavor! My noodles were soft & delicious. 5 stars! Easy, easy to make. this is great! i added a bit more garlic, pasta, and broth than the recipe called for. plus a bit of siracha, and some artichoke hearts. very filling and delicious! I’m not a super huge pasta fan but this was excellent. I don’t use full fat coconut milk (17-19%) and it still turns out very creamy. If it turns out without the onion I’ll make it more often.